A borrowed photo and a couple of links are all I have for you today, but when a recipe is worth making twice in one week, I consider it worth sharing. So may I present Pesto Pasta Salad from Alice Currah and her book, Savory Sweet Life: 100 Simply Delicious Recipes for Every Family Occasion. Even though I've made pasta salads oodles of times, this one is so simple and so tasty, perfect to make ahead, tasting just as moist and good the next day. Alice includes a recipe for homemade pesto in the book and on her blog, though I went the convenience route and used good quality purchased. I met Alice once, and she's as sweet as her book is beautiful. Take our advice and enjoy the savory sweet life. Wow - this looks and sounds delicious AND I think I have everything to make it. Thanks for sharing! Oh boy a new food blog for me to explore! 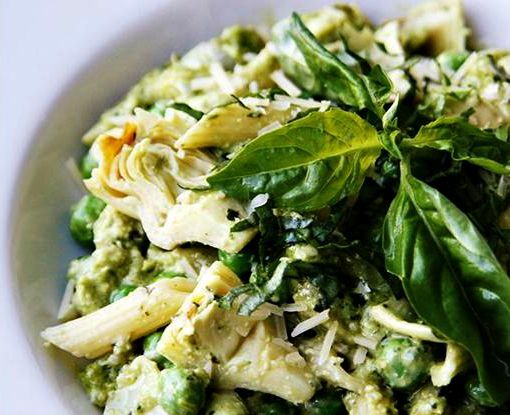 This dish looks great - I just cut back all my basil so I'm going to be making some pesto for sure. Sound delicious - will have to make this soon!